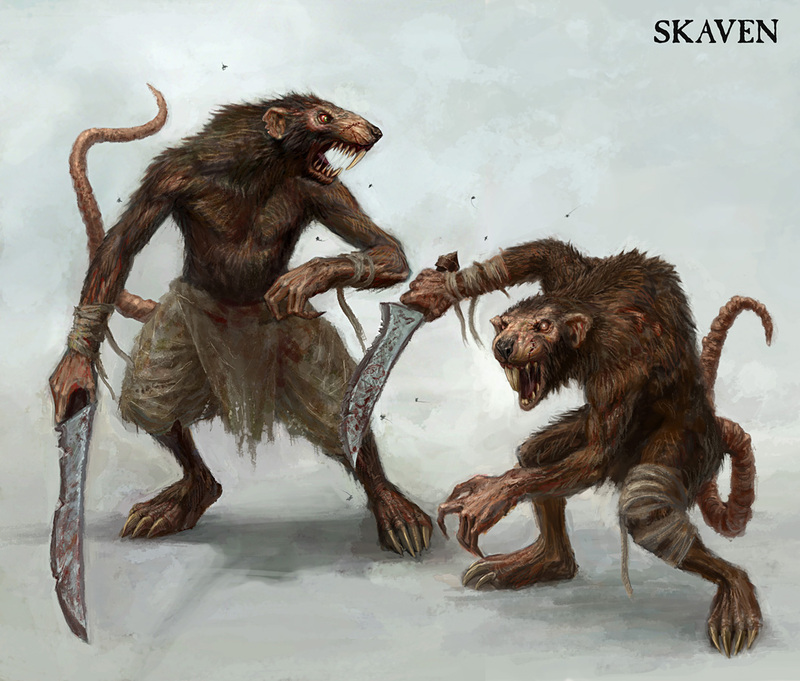 The Skaven are an insidious, malevolent race of humanoid rat-men and one of the most prolific. They follow an irregular cycle: they fight amongst themselves, expand their empire, multiply their population and surge throughout the galaxy to unleash sudden havoc. Eventually the Skaven weaken, often due to the violent treachery of the clans and sulk back to their lairs. They are decay and entropy made manifest. It should be noted that the Skaven have little to no understanding of the Force and perceive it to be magic granted to them by their god. Skaven are usually around four to five feet tall when they stand up straight, although the largest can reach six feet tall. Fur covers their bodies except for their ears, muzzles, hands and fleshy rat tails. Fur color indicates a Skaven's role in society. Most Skaven are brown or piebald. White or grey is rare and indicates leadership, intelligence and especially sorcerous ability (Force sensitivity). Those with black or dark brown fur tend to be the largest and the color is considered the mark of a born killer, and most dark furred Skaven become elite warriors or assassins. Skaven are twitchy, agitated creatures. Their metabolism allows them to burn energy at an incredible rate, boosting their agility and speed to unnatural levels. This effect also gives them an enormous hunger, which after heavy exertion can be so bad that the Skaven visibly weakens and dies. As a result the Skaven will feast on the dead of either side after a battle. Female Skaven are rare and, at most, semi-intelligent but are capable of giving birth to huge litters very frequently. This means that the Skaven will probably become the most numerous of all races. Skaven society is divided into 53 different Skaven clans, all of which are subject to the authority of the Council of Thirteen. There are four powerful clans, known as the Great clans, which dominate the weaker Warlord clans. The Great clans are highly specialized and have become an established part of the greater hierarchy of Skavendom. The Warlord clans, innumerable and expendable, also have a role in the greater scheme of things. The Clanrats of the Warlord clans make up most of the warriors in the armies of the Skaven, with the Great Clans lending their specialized support. Warlord clans have a definite hierarchy, although the positions are in no way fixed. Skaven advance as far as their cunning, ruthlessness, treachery, ambition and strength take them. Skaven within the Clan constantly struggle to ascend as well as to defend their positions from would-be usurpers. At the very peak of each Clan is the Warlord. In some of the larger clans there will then be a second rank of lesser Warlords. The next level is formed by the Chieftains, followed by a warrior class composed of Clanrats and the elite Stormvermin. At the very bottom of Skaven society are the teeming masses of the Skavenslaves. Skaven society is a lawless world where the strongest and most cunning rise to the top, while the weakest are eaten or enslaved. Every Skaven is constantly fighting for supremacy, whether to advance, or to defend his position from would-be usurpers. Fights are usually not to the death, but any Skaven who is maimed will quickly be dispatched by the victor. Treachery is not seen as dishonorable in any way, indeed it is the traditional way of advancing in Skaven society. The most important material used by the Skaven is Warpstone. It is used as an ingredient in magic, technology, mutation, metallurgy, poisons and even their currency. The god of the Skaven is the Horned Rat. Its sacred number is thirteen, and so thirteen is an important number is Skaven society. For example, there are 169 Grey Seers (13 × 13). Vermin Lords are supposedly Daemons (Force beings) of the Horned Rat, and can be summoned by a Grey Seer. This is often used as a threat to unruly Warlords, although no Grey Seer would dare to summon a Vermin Lord unless they absolutely had to. It is rare for a single clan to go to war. More often a Skaven army will contain many different clans temporarily allied together to achieve some unknown goal. The core of the army will be a sea of Clanrats and Skavenslaves. Which specialist troops the army has depends on what deals the Warlord has done with the Great Clans. For example, if the Warlord got a good deal with Clan Moulder there will be a large number of Giant Rats and Rat Ogres. On the other hand, if the Warlord has made an alliance with Clan Mekanikal he will have many Weapon Teams to support his Clanrats and Stormvermin. Skaven technology is heavily warpstone-based. Virtually everything they create has at least a tiny piece of warpstone in to increase its potency and deadliness. The majority of Skaven weapons are developed by Clan Mekanikal. The Warlock Engineers of Clan Mekanikal create infernal engines of destruction, and then bind Force energy to the machine to increase its potency and destructiveness. Some of the most feared and deadly weapons created by Clan Skryre are the Warp-lightning Cannon and the Warplock Jezzails. The Skaven of Clan Moulder are expert at breeding and mutating other living beings to create the perfect killing creature. Their Master Moulders create unnatural creatures to sell to other Clans. Some of the more infamous creations of Clan Moulder are the Hell Pit Abomination and the hulking Rat Ogres. Counted amongst their most important assets are the adepts of Clan Kaskit. These stealthy assassins are sent to murder rebellious Warlords or individual opponents. This creates a reign of fear and terror in which internal rebellions are kept to a minimum. The workings of the Council are very complex. Each member casts a single vote but his respective position also influences the proceedings. A simply majority seems to suffice for most occasions. Assassination attempts among the members of the council are considered rather too crude (and simply non-effective). Its members usually try to manipulate the greater circumstances to force an appropriate resolution of the council. Position 13: Figuratively held by the Horned Rat. Position 1: Lord Kritislik the Seerlord, head of the Order of the Grey Seers. Position 2: Lord Gnawdwell, Warlord of Clan Mors. Position 3: Lord Kratch Doomclaw, Warlord of Clan Rictus. Position 4: Lord Paskrit, Warlord-General of all Skavendom. Position 5: Lord Vrisk Ironscratch, Fleetmaster of Clan Skurvy. Position 6: Lord Griznekt Mancarver, Warlord of Clan Skab. Position 7: Lord Scythe, Soulcarrier of Clan Morbidus. Position 8: Lord Condorak, Warlord of Clan Carrion. Position 9: Lord Sneek, Nightlord of Clan Kaskit. Position 10: Lord Nurglitch, Arch-Plaguelord of Clan Pestilens. Position 11: Lord Verminkin, Packlord of Clan Moulder. Skaven society is ruled by a violent hierarchal order of clans, where treachery and tyranny are constants. The Verminus Clans are the most numerous while the Greater Clans are the most important and ruling over all of those is the Council of Thirteen. Skavendom is largely dominated by the four Greater clans. Constantly conspiring and feuding against each other, they agree in one matter: the status-quo, which puts them at the top, has to be preserved. Any ambitious Warlord clan threatening their joint dominion has to weakened and if needs be, mercilessly crushed. Even through each of the four Great clans is much more powerful than any single Warlord clan, they are concerned with the rise of Clan Mors, the most powerful Warlord clan. Clan Mekanikal, technological savants that provide war machines. Clan Moulder, breeders of war beasts. Clan Pestilens, spreaders of disease and plague. The bulk of the Skaven population belongs to the Verminus Clans, known as the Warlord Clans in the World-that-was. They are formed of petty overlords and teeming hordes beyond count. A Thrall Clan is a Warlord clan which has pledged its allegiance to one of the four Great clans. At the top is a Skaven Warlord who intimidates everyone through threats and punishment while rewarding faithful followers. He also keeps an ever watchful eye on their progress, and disloyal behavior and incompetence are punished mercilessly. The lieutenants in turn dominate their underlings through the same means. Beneath the captains of the Skaven forces run the mass make-up of the Clan, the Clanrat. Besides forming the rank and file of every Skaven army, they are also tasked with the daily chores and tasks within a Clan's warren. An ambitious young Clanrat has to prove his worth. A common way to climb the social ladder is to conspire against and eventually murder one's immediate superior, thereby creating a suitable opening in the social ladder. As a consequence all superiors watch their underlings carefully and try to intimidate them into fearful obedience and "remove" too ambitious ones. At the very bottom of the clan hierarchy are the innumerable Skavenslaves. While some slaves are non-Skaven, most are Skaven either born into slavery or captured from rival clans in war. These are destined to never see the light of day again as they toil their whole lives in the mines and tunnels or are sacrificed in bloody rituals to the Horned Rat. Mors - Warlord Clan, the most numerous and powerful of the Warlord clans, may soon fall victim to the four Great clans. Rictus - Warlord Clan, breeds an unusual high number of Stormvermin. Skab - Warlord Clan, it was recently severely decimated by an alliance of Clan Ferrik and Clan Carrion. Carrion - Warlord Clan, expert scavengers. Ektrik - Thrall Clan, thrall of Clan Mekanikal. Feesik - Thrall Clan, member of the Pestilent Brotherhood, led by Clan Pestilens. Fester - Thrall Clan Member of the Pestilent Brotherhood, led by Clan Pestilens. Festerlingus - Warlord Clan, a breakaway of Clan Fester. Gratzz - Thrall Clan, member of the Pestilent Brotherhood, led by Clan Pestilens. Kreepus - Thrall Clan, thrall of Clan Kaskit. Makris - Warlord Clan, was too ambitious and defied the Council of Thirteen. As punishment it was butchered without mercy, but members of the clan do survive. Morbidus - Thrall Clan, member of the Pestilent Brotherhood, led by Clan Pestilens. Septik - Thrall Clan, member of the Pestilent Brotherhood, led by Clan Pestilens. Skrat - Thrall Clan, member of the Pestilent Brotherhood, led by Clan Pestilens. Treecherik - Thrall Clan, thrall of Clan Kaskit. Volkn - Warlord Clan, its warriors bear blades of black obsidian and they are known for dying their fur bright red.